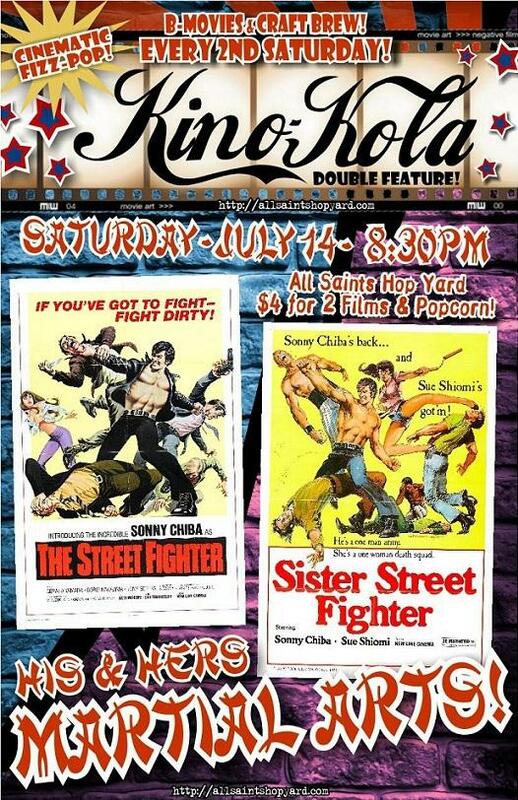 Schlock-Wire: Kino Kola’s July Show Offers “His & Hers Martial Arts” With THE STREET FIGHTER And SISTER STREET FIGHTER – Schlockmania! Summer used to be the time to go to the drive-in… and it is once again thanks to Kino Kola, the monthly outdoor double-feature program at the All Saints Hop Yard. This month’s show arrives on July 14th and offers a colorful, exciting alternative to the usual Saturday night shenanigans. This month’s double bill is entitled “His & Hers Martial Arts” because it offers a swell pair of hard-punching, high-kicking action flicks. The first is The Street Fighter, the classic grindhouse favorite starring Quentin Tarantino’s favorite martial arts star, Sonny Chiba. In this film, Chiba plays Terry Sugury, an enforcer who’ll take on any job if the price is right. He gets involved in a tricky rescue scenario that involves him fighting all manner of oddball Yakuza thugs in a down-and-dirty style. Highlights include a scene where a skull-crushing punch is illustrated via an x-ray closeup and a super-melodramatic flashback which reveals the childhood trauma that made Terry so mean and tough. The bone-breaking continues with Sister Street Fighter, a femme-friendly spinoff of the Street Fighter series that highlights a Chiba protege, Etsuko ‘Sue’ Shihomi. In this outing, she plays Tina Long, an expert fighter who goes undercover for the police when her brother disappears during an anti-drug operation. This sets up a long string of fights with colorful foes like the Amazon 7 (who all dress in cavewoman-style togs) and some pseudo-James Bond escape scenarios, including our heroine being suspended over a pit of spikes. Like The Street Fighter, it feels like a trashy martial arts comic book brought to cinematic life – and a cameo from Chiba further ups the fun quotient. Admission to this schlock smorgasbord is only four dollars. As an added bonus, the show will include a fistful of thrilling movie trailers from the ’70s and ’80s to ensure you go into exploitation movie overload. If this senses-shattering program makes you crave nourishment, the All Saints Hop Yard offers a full line of craft beers and wine to quench your thirst and Kino Kola will take care of your munchies with freshly-popped popcorn and a variety of delicious, affordably-priced candies. So be there or be terminally uncool. The gates open at 7:30 and the show starts when the sun sets. As a colorfully-plumed man once said, “Saturday night’s alright for fighting”… and you’ll get your fill of weekend action at the Kino Kola.